I was gone almost all day yesterday (4/28) and I’ll be busy for the next few as well. I could, tonight, if I didn’t do anything else, file 500+ pieces, and I’d catch up with April’s goal before 5/1. But I’m not going to. I have a high-stress day tomorrow and the stress will continue through Weds. I have a tax appt. Thurs, which means Weds. night will be spent gathering data, no time for filing, except as related to taxes. So, the earliest I can really do this without being nutty is Thursday 5/3. I’ll do it then. De-hoarding the house is stressful enough without layering it on top of other high-stress tasks. I can only do the de-hoarding because I’m world-class stubborn. Because I play it as a “game.” Because I refuse to live like my abuser did any longer. Because my husband and I really need a clean home. I still have all those reasons I got here. If you think this is easy, then you’re not paying attention. I am not going to make a public circus of how and why I got here. This is NOT one of the hoarders shows. I cannot imagine letting anyone do that to me. I can’t imagine letting things go so much they’re a health hazard either, but. . . . I had a professional organizer, years ago now, be really friendly to me, for a while. I thought she was my friend. She had in mind an early version of the Hoarder show. I didn’t even have to think about it; I just said “No.” and gee, guess what? She wasn’t friendly any more. Not a nice human being. I’m REALLY glad I didn’t let that person into my house! Cook Book Challenge, Can I Do This? I’ve been reading this book from the 1960s on making cheap dinners. It has no non-meat based meals and uses lots of prefab stuff I wouldn’t. On the other hand, they also deliberately use many of the bits/pieces left from one meal to the next. But they don’t use trimmed fats, HM bread, etc. The book is from 1967, just about the time I was first starting to cook. The menus have usually 2 starches in them, bread & potatoes too, which I also wouldn’t do, and many fewer green vegetables. It’s an interesting read. I think I’ll find one of their menus and price out what it would cost to make it now, just for grins. The rate of inflation between 1967 and 2012 is 586.8%, so that a $1 meal should cost $6.87 now. Don’t let anyone fool you that we don’t have any inflation, even at 1-2% a year it adds up over time! I wonder if their menus will work in that price range? We’re having hamburgers for dinner. There are three recipes in the book that use ground beef, none of them as simple as hamburgers: herbed ground beef, ground beef and cheese, and ground beef with chili beans. The ground beef and cheese looked maybe like cheeseburgers, but no. The recipe is a stuffed hamburger with the meat formed around a slice of cheese. Okay, I bought meat yesterday, on markdown sale. I have 1.13 lbs of 85% ground beef. Regular price $4.19/lb, original price was $4.73 – I got it for $1.50 less than that, or $3.23, which is only $2.85 a lb. The ground beef price in the book is .52 a lb, or 18% of what I paid for my pretty good deal! So much for feeling really good about that price ‘eh?. If I’d paid .52 a pound, my package of beef would have cost me .59 ! Acc. to Jill Bond in the Mega Cooking book, ground beef comes in 25 lb tubes. I wonder if I agreed to buy that much how much I’d have to pay for it? DH will cook the beef in 2 patties and cook them with a little sweet onion, olive oil and Worcestershire Sauce. We’ll have bagged veggies with it, probably green beans, as that’s what we’ve got open. The veggies were I think $2 a bag, on sale. I have no idea what I paid for the onion! I buy them at near wholesale in the fall from a farm stand the day they close for the season. I don’t know what I paid per pound! Figure the beans are 1/4 of the package, that’s .50, the meat was $3.23. I’ll guess $2 for everything else: part of an onion, the olive oil, margarine (on the beans), and Worcestershire, then it’s $5.73 or $1.14 less than what I figure their $1 meals would be, above. Sigh. I thought my cost was better than that, but live & learn I guess! And, if I figure in energy costs, I’m sure we’ve spent more than they had. Although, in all honesty, their figures didn’t include energy costs either. Note: On 4/29 I went to make dinner and found that DH had only used 1/2 the hamburger when he made them. I cooked the rest of it up with chili powder and onions and we had tostadas for dinner, and there was some left over. DH will probably use that for a lunch. This means that the package of meat, which cost $3.23 actually was used in 5 portions (2 hamburgers, 2 tostadas, 1 single meal), or a cost of about .65 each portion. That means that instead of the .52 the meat cost in the original recipe for a meal, it costs us $1.30 for 2 meals, which might be the best I can hope to do? If you’re curious why I haven’t (apparently) posted anything lately . . .
Look at my new page, the Tally link above. I’ve been working on the de-hoarding effort! Today I’m going to the antique store, so the totals will be updated to reflect my sales. It will reflect what (if anything) I buy too. Tomorrow I won’t post, I’m busy elsewhere. . .
“About” which is making a de-hoarding or cleaning goal. I have a goal elsewhere which was to clean a little room in my house (we have 9) for a month. I cleaned the room once weekly, for a month, so it counted as 1 item out. This is like the REVEAL, where I’m giving myself a point for tackling a really dirty job. If I give myself points for only the stuff out, I’ll pitch stuff right enough, but keep avoiding the untouched spots. Also, I determined that my hoarding undo required two things: less stuff AND new habits. The REVEAL and DE-HOARDING or CLEANING GOAL fall into the new habits category. We have a food contribution to make for a get together, so I had to make it. I settled on dip/sliced cheese & crackers and oatmeal/chocolate chip cookies. When I went to the market for the ingredients, I found fresh fava beans on sale .49 a lb. I’ve never cooked with fresh favas, but protein-rich food for .49 a lb, fresh? You bet I grabbed it. Also had asparagus marked down to $1.99 a lb. I thought about it and checked the frozen food aisle, just to make sure I wasn’t making more work for myself, but NOT saving us money. The frozen vegetables I found were $4.00+/lb, so freezing my own for $1.99/lb is a bargain! Now I have 3 bunches of asparagus to process and a LOT of fava beans and the food to make. With luck I’ll be done before 3 and I can go run errands. I’ve never prepared fresh fava beans, I went looking for instructions and found some at a blog called affairsofliving.com. Really interesting blog, I’ve already recommended it to two friends. I’m going to see how much I can get done on the house projects this weekend. There’s a BUNCH of them, and now of course they include processing the beans & asparagus too! Have a wonderful weekend everyone! I have worked in and around the book business for more than 20 years. I ran a used book shop for 9 years. Due to various things, the store’s inventory was moved into 3 different locations and arranged (reorganized) more often than I care to remember, usually to try and get more books on the same shelves. One thing you do when you have a bookstore rather than a home library is frequently sort the books by format: that is by size/ binding. If you haven’t done this, look at your books and see if it makes sense. Do you have a lot of books of a certain size? Large (called “trade”) paperbacks I’d plan to shelve with the hardcovers (unless you have a large quantity of them). Rack-sized paperbacks ( “mass market”) I’d usually shelve by themselves. For oversize books, coffee table books and kids’ picture books, you’ll probably want to put them on the lower shelves. Depending on how many books you’ve got, the size of the space, and budget, here’s what I’d do. Booksellers adopt types of boxes. It’s much easier to estimate space/storage requirements when all the boxes are the same size or two. Professionals do this, but I realize you can’t always. To help this, try packing your most owned type in the same size box, if you can. This will help when you are doing your estimate, below. Do this for each size of book. If your books aren’t boxed, but are on shelves, you already know how many board feet you need, to start with. Do the 1′ test for the books that have no home. Then you know approximately what you need in terms of board feet. That is, you know how long the new shelves added together have to be. For the depth of the shelves, there are some typical sizes. You’ll probably need deep shelves for the picture books and coffee table books on the lower shelves. Not only is this easier, but it means that you won’t have a 4lb book land on your head (nor will your kids). Also, it makes books more accessible for children. There are no absolute “standard” sizes for hardcovers, picture books, kids books, etc. But the shelving sold by one of the biggest library supply companies in the US is available in 10″, 12″, 20″, and 24″ depths. So what I’d do is probably draw a line on a piece of paper the depth that you’d think would work, and check those 1′ stacks. Would all the books fit on a shelf that deep? For your budget I’d start with whatever standard board widths are easily available in your area and see if you can plan your library to use those. Call a lumber yard or go by and talk to them about your shelving needs. WARNING #1: If your line is 12″ and your average book is 14″ deep, it doesn’t look like much, a full shelf of books will be fine. But after you remove a book or two, it’s easy to create a situation where you’ll be “rained on.” This is very uncomfortable as well as potentially DANGEROUS. If your average book is 14″ deep, make your shelves at LEAST 14″ or preferably 14.5″ deep. This won’t stop the raining books entirely, but it will be MUCH rarer! Ideally, shelves should probably be at least 1″ deeper than the books they hold. WARNING #2: Kids love to climb bookshelves! (I did.) Make sure all bookcases that kids could potentially climb are ANCHORED to the WALL. For safety, anchor them all anyway, but especially if you have kids. Wobbly bookcases are a dangerous situation looking for the right time to prove once again that Newton was right about gravity. Books are heavy. Bookcases, built to carry them are heavier. Bookcases full of books are VERY heavy. Once you know how many linear feet you need and how deep the shelves should be, you can price out the wood, bricks, supports, or whatever. To get more mass markets (almost all the same size) on a shelf, flat stacking them on their sides will usually allow you to get more books per linear foot than if you leave them standing up. If you put them in order standing up and then just rotate them 90 degrees to the left to lie flat, the books that have been left to right will go from the bottom of the stack to the top. My store shelves were set up this way. It takes a little getting used to: bottom to top, but it can nearly double the mass markets you can get per linear foot. Flat stacking doesn’t work as well for hardcovers and trades because of their differing sizes. For hardcovers/trades,what I usually did was do a back layer of mass markets if I had to have the space. An average mass market is 4.5″ x 7.5″ in the U.S. If you’re sorting your books by category, try putting the tallest books on each end of the shelf and the smallest in the middle. This uses the larger books to help bookend the smaller ones. Because I know about flat stacking saving space, I play with books on my shelves to see what’s best for a given category. Sometimes they’re flatstacked. Sometimes they’re mixed due to function — I want all the cookbooks together for example. Some are double- and triple-stacked. I’ve seen people with more books than money stack books and put a piece of glass or plastic on top — to make a table. This works fine in a corner or such, but don’t lean on it! Warning 3: If you have children, the potential for a disaster is just too big, don’t do this! If you don’t have a pretty stack of books and/or piece of glass, the table idea can be done with a board and then covered with a tablecloth. Decorators these days seem to put small stacks of books on the floor next to easy chairs or in other locations. That’s fine, if you rarely want the bottom book! If not, it’s problematic. One bias I didn’t talk about last time was time, I really dislike recipes that keep me in a kitchen chopping, stirring, etc. for more than half an hour at a stretch. I don’t mind multiple half hour cooking bouts in a single day, but if I end up standing and prepping something for more than about 30 minutes, I lose patience. My onions get rough-cut rather than diced. I dump all the flour in at once (and get lumps), etc. I’m an impatient cook. If I can start something, leave it alone for a while and come back to it? That’s great! But if I have to babysit it more than 30 minutes? I won’t do it carefully. Obviously, I was never cut out to be a professional cook! I realized a few years ago that nearly all my cookbooks were how to do more with less (time, money, or ingredients). The books I keep usually fit within my time bias. Many books I’ve kept I use only for reference, or I use them for ideas or techniques. All of these books are in my permanent collection, that is, they’re “keepers” unless something drastically changes! Bond, Jill – Mega Cooking (2000 Cumberland House, 445pp). A quantity cookbook that’s adaptable, she gives recipes 1x, 2x, and 10x. Has the most reasoned discussion of cooking techniques I’ve found in a home cookbook. Her focus is on doing things with the least amount of effort and freezing a month or more’s worth of finished foods, or ingredients. Like me, she has a thing about sauteed onions. She eliminated them entirely. I don’t like starting most dishes with sauteed onions either, seems like a lot of repetition. I make mine up in a crock pot, a pint or so at a time (3C chopped onion, 1 stick sweet butter, cook on low til golden brown. Store in Ball jar in fridge.) She includes comments of other cooks on her recipes, and talks about buying foods wholesale, etc. Great discussion about freezing foods, what works/doesn’t and why. Probably the most adaptable from home to commercial type cookbook I have. Wolf, Ray (Ed.) 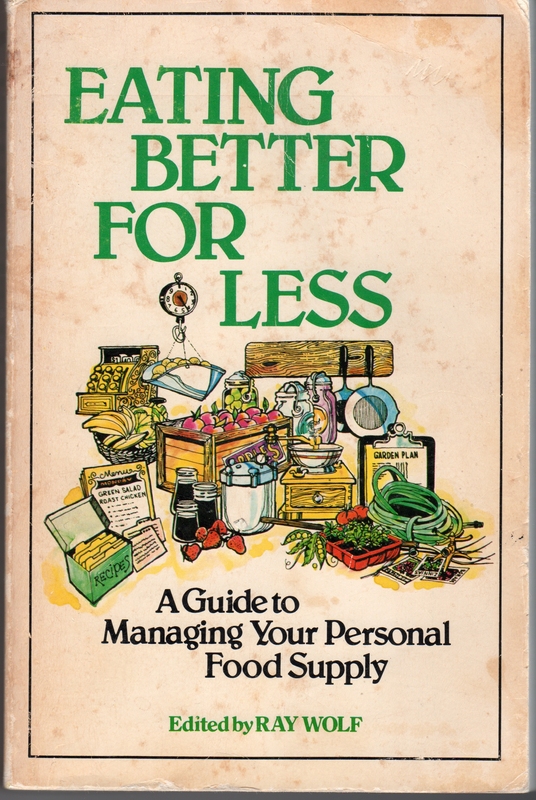 – Eating Better for Less: A Guide to Managing Your Personal Food Supply ( 1977-8, Rodale Press, 467pp). This book is more a discussion of food, food sources, storage, ingredients, etc. than a cook book. There are discussions of health/nutrition/diet, growing/raising your own foods, and using your foods more efficiently. The last two chapters (Turning Your Kitchen into a Food Processing Center/Using Your Food Supply More Efficiently) are where you’ll find all the recipes. Also includes a discussion about whether you should make or buy something and talks about the effort required, like Bake the Bread, Buy the Butter, but this book is much earlier. Has ethnic recipes, I love their Sopa Seca recipe (pg 406). I learned a lot from this book, and have used/modified recipes in it for years. I still look at it, though I mostly use it only as a cook book these days. 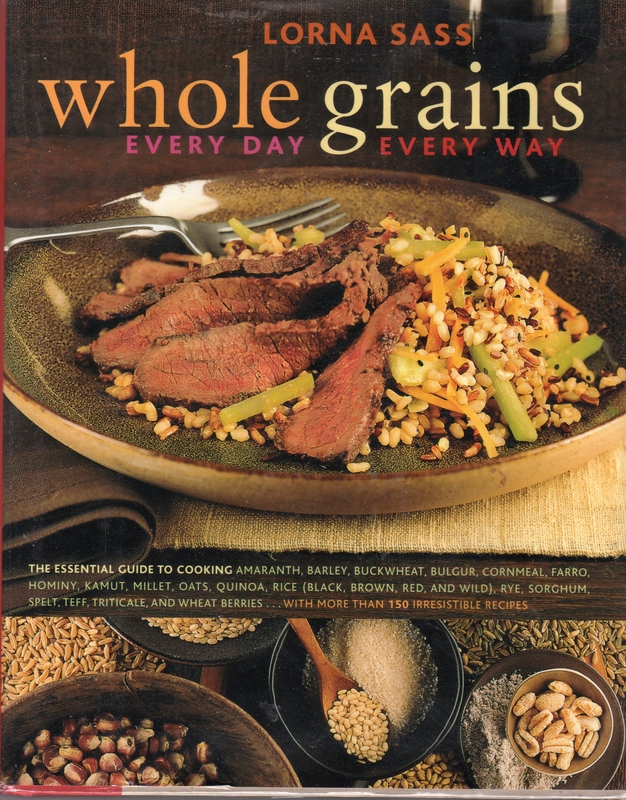 Sass, Lorna – Whole Grains: Every Day, Every Way (2006, Clarkson Potter, 323pp). This book introduced me to a new realm of grains I had no idea existed! It’s the reason I bought the Madagascar Pink Rice and the Forbidden Black Rice. Sass is a professional cook book author and discusses what she did in her testing, and has recommended basic cooking techniques for the grains she covers. Many of her other recipes intimidate me. They look complicated, and somehow they “feel” like recipes I’ll try and won’t work. I intend to try some of the simpler ones, but things like Brown Rice Salad with Flank Steak with Asian Flavors (pg 150) with 19 ingredients and over 1 page of description I will probably never make. Others, like Millet with Buttermilk & Chives (pg 226) with 6 ingredients I probably will. 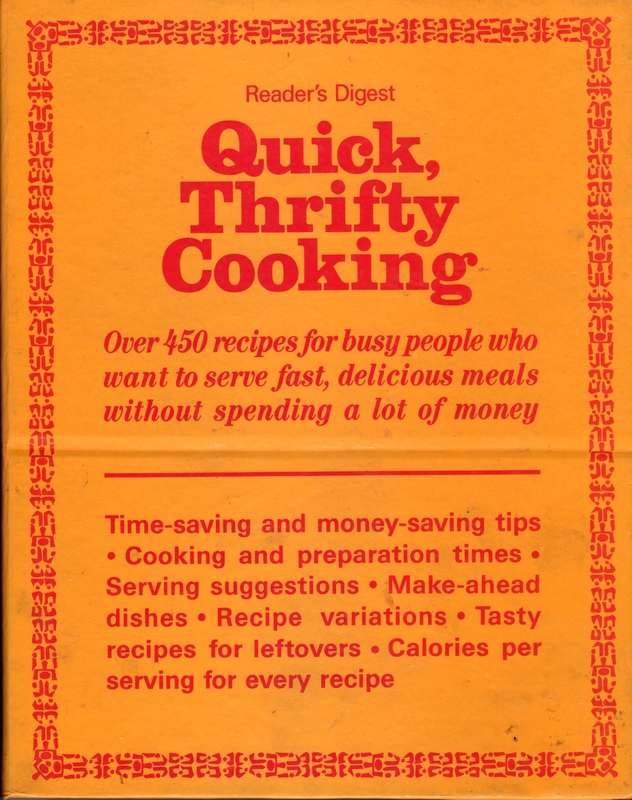 Readers Digest – Quick, Thrifty Cooking (Reader’s Digest, 1985, 256 pp).